SWBAT use a hundred chart to find sums. Hundreds charts allow for children to visually follow along and see how the numbers grow as they apply the counting on strategy to greater numbers. Write a two digit number with 0 ones. Write a two digit number with the same number of ones and tens. Write a two digit number with 6 tens. Write a two digit number with 6 ones. This activity gets them thinking about place value and the importance of have the correct digit in the correct place. The standard NBT.C.4 includes multiple strategies for adding a two digit number to 100. A hundred chart is another tool that can be used to show children "why addition works." Children are familiar with a counting on strategy for basic facts. Hundred charts allow children to visually follow along and see how the numbers grow as they apply the counting on strategy to greater numbers. They can touch each number as they count on across the row to add ones, or count on down the columns to add tens. Alice picks 12 flowers. Then she picks 4 more. How many flowers does Alice pick? I then read the next problem: Jim picks 10 strawberries. The he picks 20 more strawberries. How many strawberries does Jim pick? I then work through the next problem with children to solve 24 + 4. Have children write the sum. I also work through the next problem with children to solve 31 + 40. Have children write the sum. Then I work through the final problem with children to solve 61 + 8. Have children write the sum. 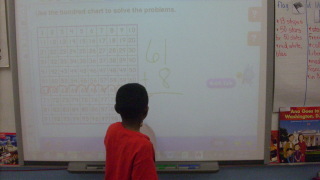 This pictures shows a student demonstrating how to move across the hundred chart to add. For the independent activity, I use Use a Hundred Chart to Add_worksheet to check for understanding. Point to 51 on the hundreds chart. Model how to add 51 + 4. The important part of this lesson is to make sure that the students start at 51, and don’t start counting on to add until 52. (Make sure that they move one space to the right for each number they are adding.) To get them to understand I have each student put their finger on 51 and we start counting forward together. We work through more problems together, and adding 10 to a number until they are ready for independent practice. Write a number sentence to add 6 ones to 21. Write a number sentence to add 6 tens to 21.